Enrico Sivieri, piano accompanist, Zoltán Fekete, conductor, RAIS Symphonie, November 8, 1953, Sportpalast, Berlin. CD version has 1 CD. They will put a smile on your face!The Director and Curator of the Beniamino Gigli Museum and President of the Beniamino Gigli Music School, Gigli’s nephew Professor Luigi Vincenzoni, told me in 1996 that Gigli should have retired some years before 1955 since he no longer had the voice he had had in the 20s and 30s. But I find the Gigli of the 20s and early 30s monochrome, lacking not only in painterly imagination but also in depth of feeling, and take greatest pleasure in the Gigli of the 50s. It was then that he no longer was a slave to technique who crammed his voice forward into the mask and covered his tones from F-sharp on up by formula. It was then that his singing was fully nuanced, with the voice at the service of expression. For the Gigli of the 20s sonority was paramount. For the Gigli of the 50s expression governed. He brought words alive and captured the music’s flow. The shift from one Gigli to another seems to have begun in 1942, as documented in the film Ridi Pagliaccio. Consider two recordings of the Vincenzo De Crescenzo Neapolitan song “Quann’ a femmena vo’,” one from a 1925 studio session, the other from this concert. In the 1925 recording he sings the piece in G major (see the sheet music here or see the lyric and translation here). But in this concert he transposes it a minor-third higher, into B-flat major. Why? Provided one needn’t cover head tones, they offer greater variety of tonal nuance than chest tones. By the time of this concert Gigli no longer had to cover notes in the passaggio or above. His objective may have been to exploit the tone colors he was able to avail himself of in the higher key. In the 1925 recording the effects and chiaroscuros seem studied. In this concert they appear spontaneous. In 1925 the music fragments into notes rather than phrases, possibly because Gigli is working at the inflections. In this concert he not only puts in many more inflections but also captures the music’s lilt and sparkle. In 1925 he dutifully sings the notes. In this concert his intonation is better, he lengthens notes here and there for emphasis, makes slight adjustments of tempo and moves the music ahead with crescendos that span groups of fast-moving consonant-encrusted notes. His performance is a subtle yet towering example of musicianship and virtuosity. Other tenors have had longer breath spans or greater extensions on top or bottom. But as this concert reveals, no tenor on records had as many colors on his palette as Gigli. His interpretations were more imaginative than any other Italian tenor’s, maybe with the exception of Fernando De Lucia’s. Other tenors do what they can with their voices. Gigli more or less did what he wanted. In the 1920s and early 30s Gigli always was in voice. In the 1950s he was erratic vocally, possibly because of many health problems. As in all his late performances, during this concert you hear him clear his throat again and again, suggesting that he had sinusitis, a cold or allergies. Yet his mezza voce is undisturbed. An oddity of the concert is that the orchestra accompanies some arias, a piano others. Hadn’t the orchestral parts arrived for some arias, or was there no time to rehearse? A Gigli collector, Steve Abrams, of London, England, suggested that the selections sung with piano are encores. In any case one can hear that the orchestra tuned to a higher A than the piano did, but the disparity caused Gigli no disorientation. In “Dalla sua pace” the score indicates that the word “morte” should be sung with “mor-” on a middle-voice D and “te” on the G above. 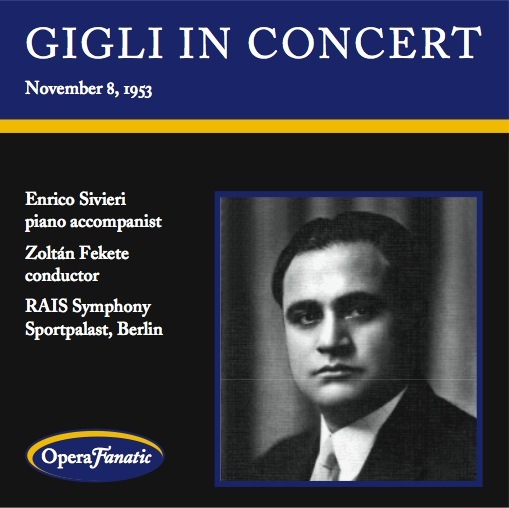 In all his recordings of the aria, including this one, Gigli instead attacks the G on “or” and then switches to “te,” presumably so as not to compromise the stress of the word (which should be “morte,” not “morte“). When my mother, Rosina Wolf, sang Donna Elvira in Italy in 1951, with regard to “Mi tradì” she was told not to sing “infelice” with “ce” on the attack of the A-flat but to begin the A-flat on the “i” and then introduce the “ce.” In America she was told not to do this. In Italy fidelity to the stress of the word took precedence over fidelity to the score or even to the musical intent. 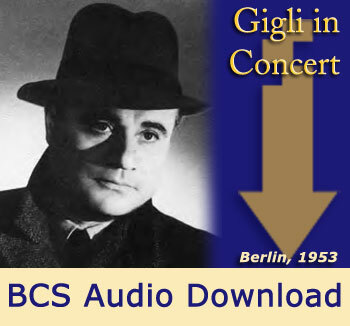 Gigli sings “La donna è mobile” like no one else, playfully, with a broad spectrum of tone colors, and his treatment of the grace notes is particularly effective. In “Che gelida manina” he sings some of the words with a chuckle in his tone. He sings “Talor dal mio forziere” heavily covered but in one breath. And then comes the B-natural. He reverts to singing “La-a-a-a speranza,” holds the B, makes a portamento to the B-flat, takes a breath–and only then introduces “speranza,” true. But the B itself is thrilling, and he sustains it. From the late 1940s onward his breath span was shorter than it had been, but he had easier access to top notes than before 1931, and his intonation was better than in the mid and late 30s. Predictably he sings the climax to “Vesti la giubba,” “Ridi, Pagliaccio, sul tuo amore in franto!” with soul-searing passion. I cannot imagine a better piano accompanist than the one for the live concert, Enrico Sivieri. He knows when to follow, when to take the lead. Never does he straitjacket Gigli. And as a pianist he knows how to subordinate harmonic filler to melodic or harmonic content.